Following reports of substandard foods served in prison cafeterias and resulting objections from prison inmates this year, awareness about the quality of foods served to our nation’s inmates has increased. A number of non-profit organizations and innovative correctional facilities have taken to improving their food service operations in recent years by working to source more local foods for inmates, with an emphasis on increasing the availability of fresh fruits and vegetables, as well as other healthy foods. Here is a list of six farm-to-prison programs that are making a difference in the lives of the incarcerated by sourcing from local vendors, and in some instances, even growing their own produce. Earlier this year, San Diego’s Richard J. Donovan Correctional Facility established the Farm and Rehabilitation Meals (FARM) program with an intention of improving the foods served in their prison cafeterias. The program has set aside 3 acres of the prison grounds for growing, and has trained 20 prison inmates to tend and harvest the garden with the help of prison staff gardeners and volunteers. The farm will produce fresh fruits and vegetables for consumption in prison cafeterias, with surpluses donated to local food banks. Costing only $4,000 to establish and funded entirely by private donors, the FARM program is projected to save the facility in food procurement costs by supplementing the menu with house-grown produce. In addition to providing inmates with fresh food, the FARM program will also offer inmates an opportunity to develop gardening and farming skills while gaining an education about sustainable agriculture and healthy eating. Program coordinator Wehtahnah Tucker hopes that FARM will improve inmate nutrition and health through the increase of available fresh produce, while decreasing the prison recidivism rate through sustainable agriculture job training. In partnership with the Salvation Farms organization, the Vermont Department of Corrections has put a concerted effort towards integrating locally grown potatoes and apples into the prison cafeteria while offering inmates hands-on food processing job experience. 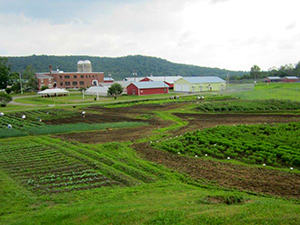 Since the programs’ establishment in late 2012, Vermont Department of Corrections inmates helped to plant, grow, harvest, and process about 141,000 pounds of 6 different crops; 2,000 pounds of have been incorporated into prison cafeterias as surplus, with the rest being distributed and donated to various food banks, schools, and other institutions in the area. The program hopes to decrease the recidivism rate by offering inmates an opportunity to develop farming skills, while offering inmates a taste of the freshly grown and harvested potatoes, apples, and winter squash. The program has set the goal of increasing the amount of produce entering the prison cafeterias by analyzing and upgrading the infrastructure of the prison kitchen facilities. In addition to their partnership with Salvation Farms, the Vermont Department of Corrections has also been successful in establishing three greenhouses on the prison grounds, offering inmates job-training in food production, and a second source of locally grown produce. Started in 2007, the Montana Women’s Prison local food sourcing program has made an effort to incorporate locally grown food products into the menu served to prison inmates. Sourcing from over ten local vendors, the Montana Women’s Prison spends about $60,000 a year on local foods, making up 30 percent of their food purchases. The prison system goes beyond produce by sourcing local beans, breads, cereal, eggs, meat, and milk, as well. The Montana Women’s Prison has also built a greenhouse on prison grounds for the prison inmates, to increase produce consumption within the prison while offering inmates the opportunity to gain job-training skills in gardening and food production. In 2010, the Washington State Department of Corrections partnered with the Washington State Department of Agriculture to evaluate the challenges and opportunities surrounding the procurement of state-local foods for two Washington State correctional facilities. A Washington State Farm to Prison pilot study was initiated at the Monroe Correctional Facility and the Stafford Creek Correctional Center, in which local sources of fresh, Washington-grown produce and food items were brought into the procurement stream for the two facilities. From 2010 through 2012 these local foods were integrated into prison cafeterias, offering inmates an opportunity to consume healthier locally grown food options and saving the correctional facilities about 20 percent on their food budget spending. The program was designed to impact on not only inmate nutrition but also on recidivism rate, as well as broader economic and environmental issues including food packaging, carbon emissions, and local economic stability. Since 2012, the correctional facilities continue to ensure the availability of fresh and local produce, but have shifted from locally procured sources to growing produce in-house.“Our focus has shifted more to the garden programs at our own facilities that enjoy supporting the prison kitchen and nearby food programs. For example, in mid-August 2014 the small 500-bed Cedar Creek Corrections Center has already produced well over 8,000 lbs. of produce from its gardens,” Washington State Department of Corrections’ Sustainable Operations Manager, Julie Vanneste, said in a recent interview. Jumpstarted in 2006 by a push from Michigan Governor Jennifer Granholm, to “buy Michigan first,” the Michigan Department of Corrections has worked to incorporate locally grown produce into their prison cafeterias. The facilities feed over 43,000 inmates daily, and now purchase over 4 million pounds of potatoes a year in addition to a variety of other vegetables from local farmer Pat DuRussell and his family farm. The prison cafeteria menu includes locally grown potatoes, carrots, collard greens, corn, cabbage, and beets. Not only has this initiative increased the availability of fresh and local produce available in prison cafeterias, it has also saved the prison system money. The local purchases have helped Michigan’s Department of Corrections to reduce the cost of the average inmate meal from $2.69 to $2.25, a massive decrease considering the number of inmates incarcerated in the state. The Oregon State Correctional Institution produces over 20,000 pounds of produce in their greenhouse, located on prison grounds. This produce is distributed between the prison cafeteria, and donations to local food banks, giving inmates access to freshly produced local fruits and vegetables, while extending the positive impact of the program beyond prison walls. The greenhouse program offers prisoners the opportunity to gain job-skills in sustainable agriculture, as well as gain knowledge on topics of ecology, conservation, and sustainability. Beyond the greenhouse, the institution currently sources a total of 37 percent of their food from within the state of Oregon.